This wonderful photograph was taken in 1936 on Stafford Orchard, the park in the middle of Quorn. The lady in the centre of the trio is Sarah Farley, when she was about 65. Sarah was the wife of Alfred Farley and the mother of Harold, Vera, Irene and Arthur (known as Alf). The family lived for many years on Loughborough Road in Quorn. Harold Farley, the eldest child, lived in Quorn all his life and became a very well known character in the village. Farley Way is named after him, and more details about his life can be found in artefacts 800 and 1384. 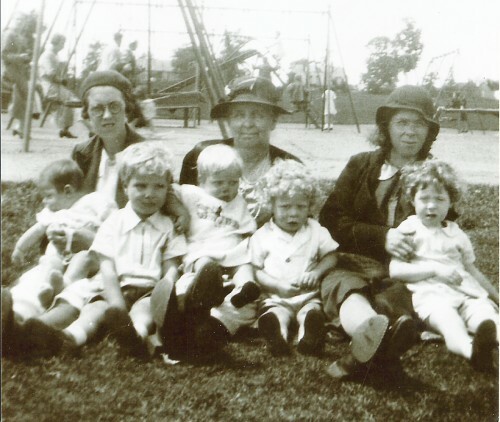 The children sitting on Sarah's knee are two of her grandchildren, (two of her daughter Irene’s children) - Betty Grundy (the baby) and Leyland Grundy. It is fascinating to see the old play equipment in the background of the picture. Whatever happened to rocking horses and eye-wateringly high slides! Please can you help? Can you identify either of the two ladies sitting on either side of Sarah? - or even possibly any of the other three children? Missing information: Can you identify either of the two ladies sitting on either side of Sarah.